An underrated and forgotten gem of the Christian metal genre. Armageddon's 'Money Mask' compares to very early Savatage or Metal Church. At least half the songs on this disc have a hook that could catch a whale. My personal favorites are the title track, "More Than Conquerors," "Mercenaries of Unjustice," "Blazing Wasteland" and "Nightlight." Some of the guitar work on this album is actually quite stunning. Vocalist Mike Vance reminds me of Jon Oliva at times with his raspy, mid-range voice and occasional high pitched yelps. Unfortunately this band broke up soon after releasing this album. A few interesting facts about this band is that they were formerly called Second Chance and released a few demos under that name. The song "(Liberation from) Blazing Wasteland" first appeared on Regency's "East Coast Metal" compilation in 1987 but under the name Second Chance. Drummer Joe Hasselvander went on to replace Mark 'Wacko' Hunter in Raven. After nearly three decades, this under appreciated heavy metal gem sees the light of day again thanks to Retroactive Records. 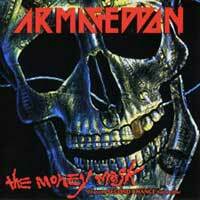 Armageddon's Money mask is a classic American heavy metal gem. The music is heavy, crunchy and features lots of sing along anthems. Musically, the band fits neatly in with bands like Sword, early Savatage, Armored Saint and Judas Priest. Basically, fits in the air, head banging heavy metal. Like those bands, Armageddon knew how to write both musical and lyrical hooks. Songs like "More Than Conquerors," "Mercenaries of Unjustice," "Blazing Wasteland" and "Nightlight" are all outstanding. Vocalist Mike Vance has a slightly raspy style that is delivered with a lot of conviction. His raspy howl sometimes reminds me of Jon Oliva on those early Savatage platters. This is especially true on the melodic "Ship of Changes". Armageddon also knew how to vary their songwriting and tempos enough to give each song it's own identity. The problem with many modern bands is that each song is delivered at full throttle with not thought to emotion or tempo change. This is not the case here. "Ship of Changes" is a melodic, ballad-like track while songs like "We're Outa' Here" and "Nightlife" border on the edge of thrash metal. Three guitarists perform on this album: Robby Lee, Charlie Phillips and Phil Zeo. The three combined give the album a crunchy, aggressive sound complete with some shredding guitar solos. It should also be noted that Joe Hasselvander of Raven/Pentagram fame plays drums on some tracks on the original album and some of the demos as well. The new remastered version of provides far superior sound quality. Overall, the levels are much louder and each instrument is clearly heard, although the bass guitar seems a bit lower in the mix than the guitars and drums. The Retroactive version includes a bonus disc on demo tracks. Unfortunately most of these tracks also appear on the album, save for "In Your Face". The rough mixes and demos tracks are a good listen once through, but chances are, this is one of those discs collector's will hang onto but hardly ever play. The 4 page booklet contains all the lyrics as well as a short biography.